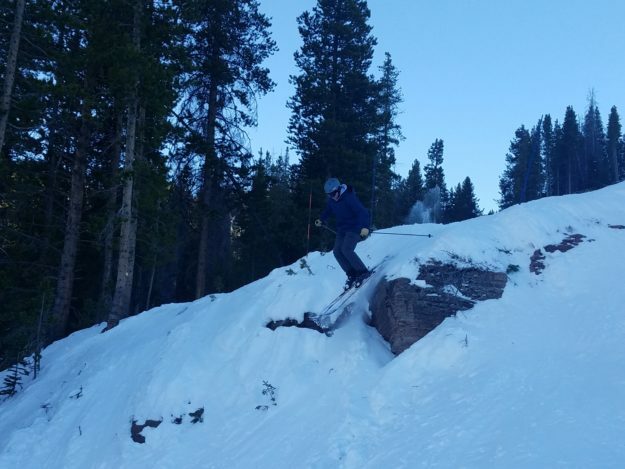 Nick Williams drops a rock on Ben’s Face at Vail on Friday. Editor’s note: Sun Up Bowl opened on Saturday morning, Nov. 24, with both Chair 5 and Chair 9 cranking up. Heavy snow started pounding the Vail Valley at about 12:15 p.m. on Saturday, followed soon after by the closure of eastbound Interstate 70 at Vail Pass at 12:48 p.m. Also, Mikaela Shiffrin finished just off the podium in fourth in Saturday’s GS in Killington, Vt.
All the talk in the lift lines at Vail on Friday – a soft and snowy day after Thanksgiving – was of a potential rope-drop on the Back Bowls over the weekend. Rumors, some of them anonymously substantiated by mountain ops workers, focused on the possibility of Sun Up and Sun Down bowls opening either today (Saturday, Nov. 24) or, more likely, on Sunday. Quick point of comparison, parts of the Back Bowls opened for the first time last season on Jan. 12. But now, helped by a half a foot of new snow since Thanksgiving night, Vail Mountain is in excellent early-season shape. Light snowfall was continuing Saturday morning and expected to carry on into Sunday. At Beaver Creek, that meant the opening of Rose Bowl on Friday, with more terrain likely to open in time for World Cup ski racing festivities next week. That, of course, means weather will no doubt be a factor for the Birds of Prey men’s World Cup races at Beaver Creek, which get under way with downhill training runs starting Tuesday, Nov. 27. The main events kick off on Friday with a super-G, followed by Saturday’s downhill and Sunday’s giant slalom. For the full schedule of events, go to the Vail Valley Foundation website. But that’s next week. The men are at Lake Louise in Alberta, Canada this weekend, and the women face the Beast of the East starting today (Saturday, Nov. 24) at Killington, Vermont. Look for EagleVail’s Mikaela Shiffrin to add to her top-five all-time win total with another victory at Killington either in today’s GS or Sunday’s slalom – or possibly both. Then the following weekend, the men come to Beaver Creek and the women will be at Lake Louise, minus Vail’s Lindsey Vonn, who has dominated on that course but is out due to a bum knee sustained in a recent crash. It was Vonn’s best chance to pick up some early wins in her final-season quest to break Ingemar Stenmark’s all-time victory record of 86. Vonn already holds the all-time women’s World Cup victory record with 82, and as an Olympic downhill gold medalist and four-time overall champion, she has nothing left to prove in the sport. Consider this: Shiffrin is fifth on the all-time list with 44 … and she’s 38 wins behind Vonn. As Shiffrin goes for her third straight overall title, here’s another fun fact: Vail Valley ski racers (Vonn and Shiffrin) have won six of the last 10 overall titles! On the men’s side, Austria’s Marcel Hirscher is chasing a little history of his own, coming into Beaver Creek next week looking to become only the second male ski racer to amass 60 career wins – still a full 26 behind Stenmark but good for second on the all-time list. Park City’s Ted Ligety sits 14th on that list, with 25 career wins, which is just three spots behind legendary countryman Phil Mahre, who’s in 11th all-time with 27 career wins.